Property Location With a stay at Mayfair New York in New York (Broadway - Times Square), you&apos;ll be minutes from Circle in the Square Theater and Broadway. This hotel is close to Times Square and Rockefeller Center.Rooms Make yourself at home in one of the 78 air-conditioned rooms featuring LCD televisions. Cable television is provided for your entertainment. 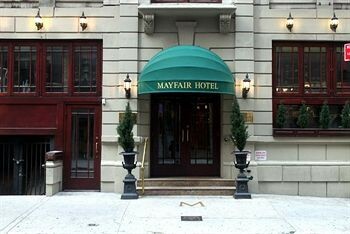 Conveniences include phones, as well as safes and desks.Rec, Spa, Premium Amenities Make use of convenient amenities such as complimentary wireless Internet access, concierge services, and tour/ticket assistance.Dining Enjoy a satisfying meal at a restaurant serving guests of Mayfair New York. Quench your thirst with your favorite drink at a bar/lounge.Business, Other Amenities Featured amenities include a 24-hour business center, limo/town car service, and dry cleaning/laundry services.